Global warming leads to increased endosymbiotic archaeal growth and generation of new organelle called the archaeaon. 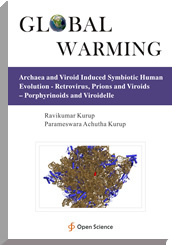 The archaeaon generates RNA viroids which can modulate cell function. These archaeaons can be called as viroidelle. The RNA viroids secreted by the archaeaon are the precursors of the retroviruses. The archaeaon can synthesize porphyrins which can self-organise to form self-replicating organisms called porphyrinoids. The porphyrins can form templates for prion and RNA viroidal formation. Thus the porphyrinoids and viroidelle are crucial cellular organelle generated by symbiotic evolution.